Heat grill. Alternately thread pork, mushrooms and bell peppers on four 10 to 12-inch metal skewers. In small bowl, combine barbecue sauce and hoisin sauce; mix well. When ready to grill, place kabobs on gas grill over medium heat or on charcoal grill 4 to 6 inches from medium coals. Brush kabobs with sauce. Cook 11 to 13 minutes or until pork is no longer pink in center, turning frequently and brushing with sauce. Discard any remaining sauce. To broil kabobs, place on broiler pan; broil 4 to 6 inches from heat using times above as a guide, turning frequently and brushing with sauce. Hoisin sauce is a sweet-spicy sauce made from soybeans, garlic and chiles. The thick, red-brown sauce is common in Asian cooking, both as an ingredient and a condiment. In this recipe, hoisin sauce gives barbecue sauce an Asian flavor. 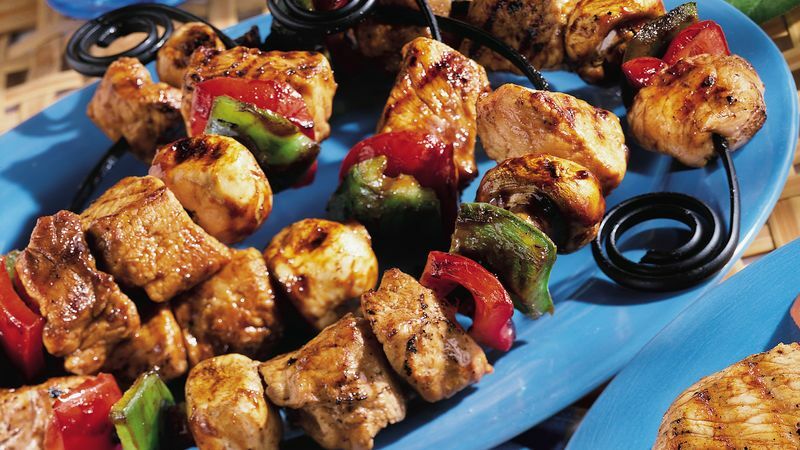 Use thick-cut boneless pork loin chops for these kabobs. Thick pork cubes grill nicely without becoming dry. Colorful sweet bell peppers make pretty kabobs. In addition to red and green, you can try yellow, orange or purple peppers.